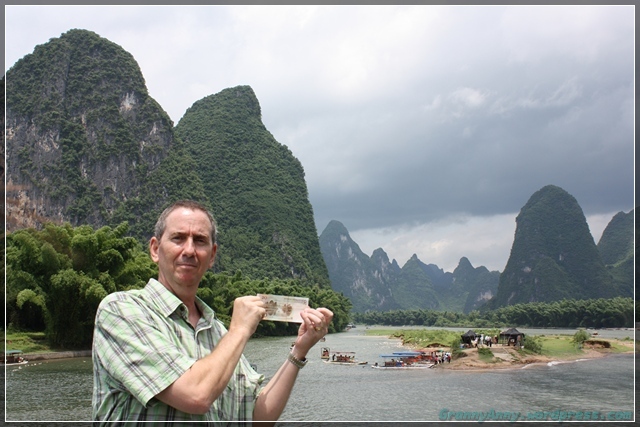 Hubby was posing with the 20 Yuan, where the picture printed on the back of the currency was based on the view of these particular hills on the Li River. 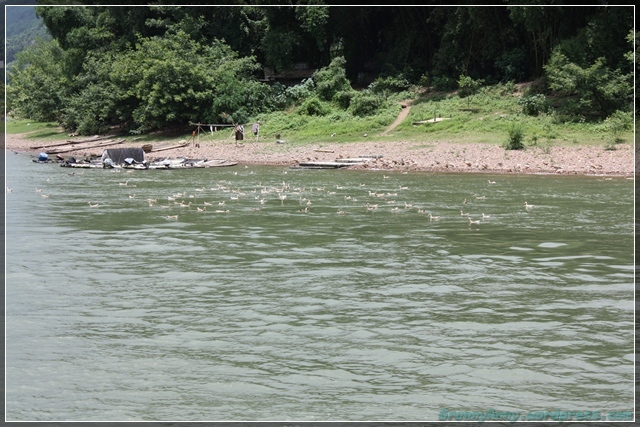 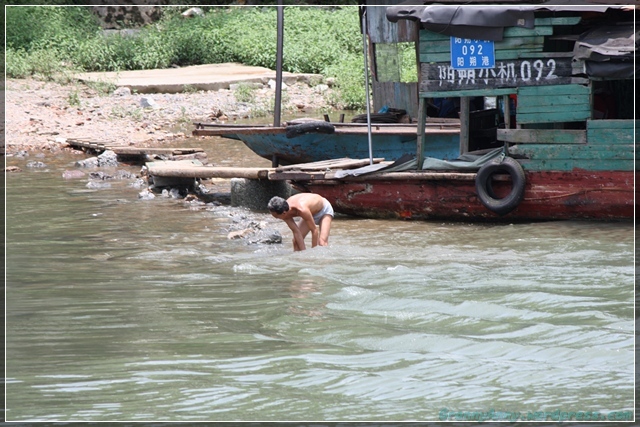 Here, Hubby saw these people washing the dishes from lunch using the river water. 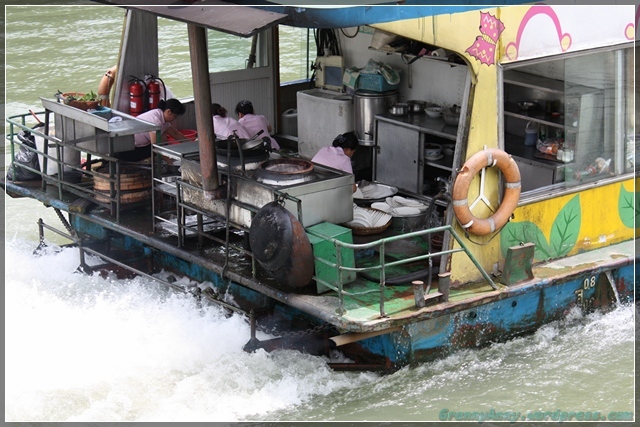 We were lucky that we did not get sick from the food. 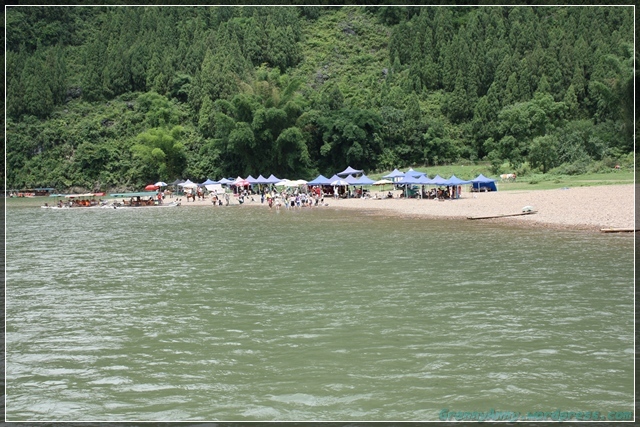 Most of the Columbian tourists brought sandwiches or fruits with them. 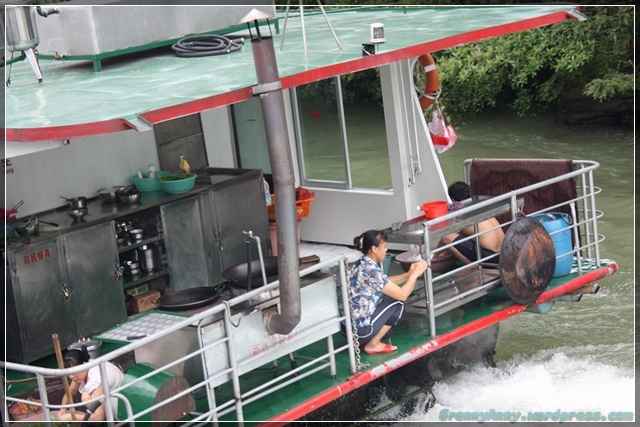 We weren’t aware of how bad the food was on these boats, so we did not prepare anything. 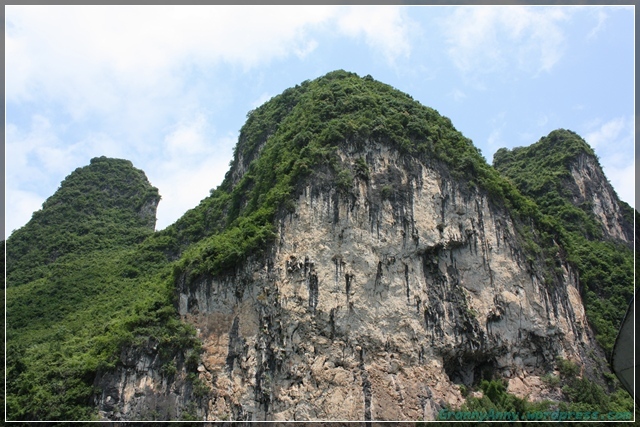 Otherwise, we would have packed sandwiches or snacks as well. 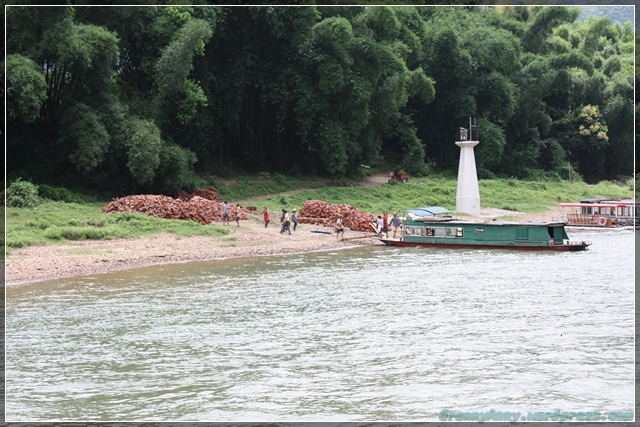 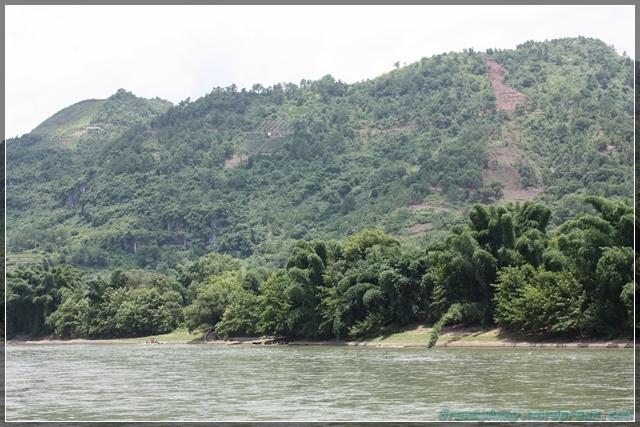 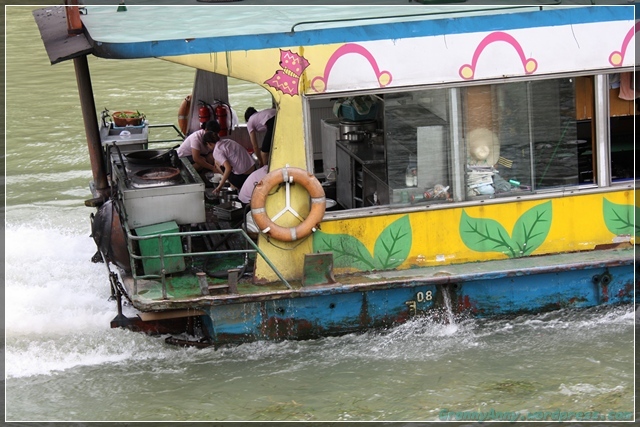 So if you are going to take one of these river cruises, be prepared. 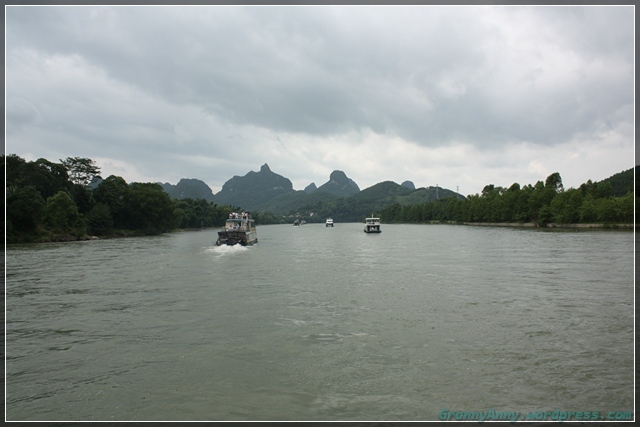 As you can see from the pictures below, starting at this point and Yangshuo, the scenery was not as pretty as the previous parts of the river. 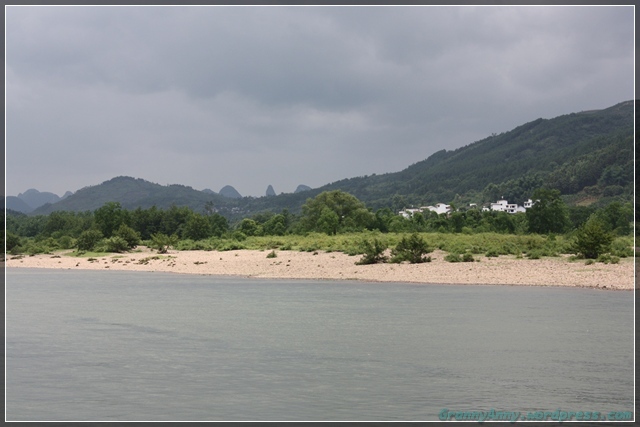 There were a few clouds hovering on top of us, and we got a few drops of rain here and there. 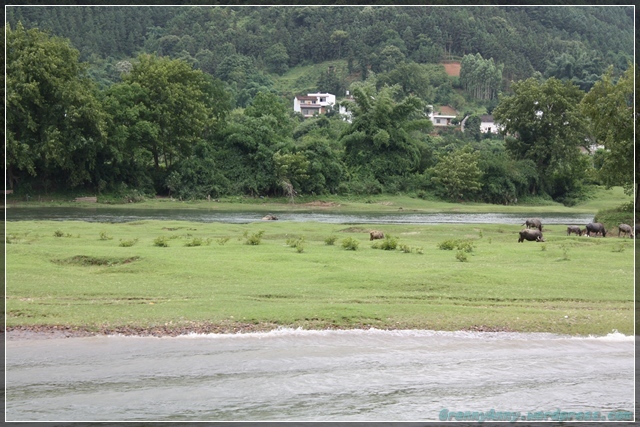 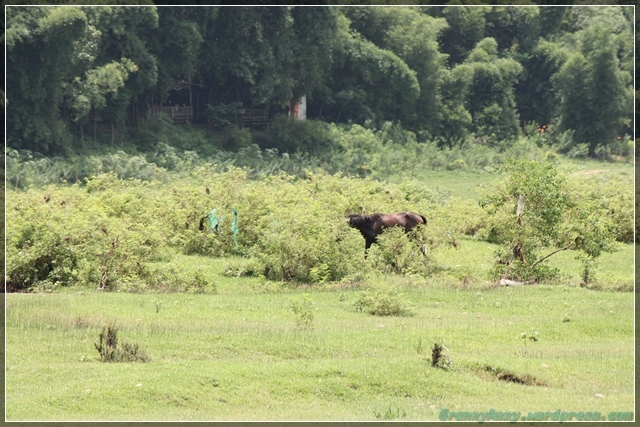 The mama water buffalo was herding its baby to walk through the water toward the other side of patches of land. 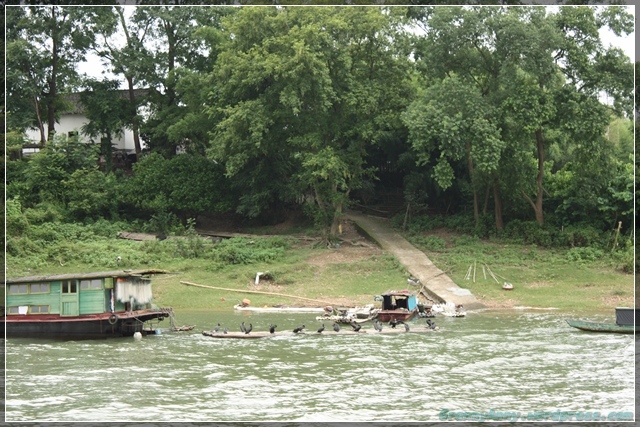 These are cormorant birds. 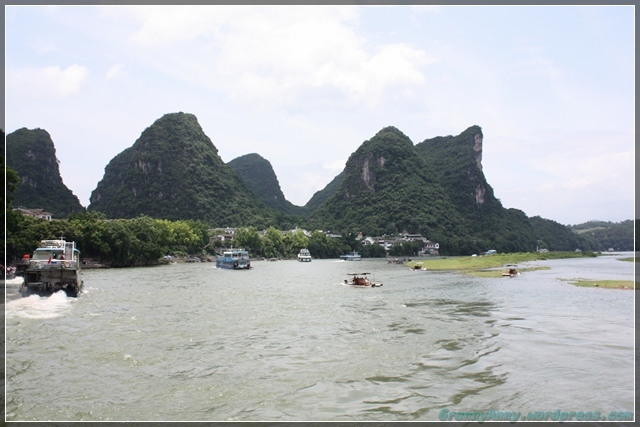 As we landed in Yangshuo, we saw several fishermen having two birds with them, and they charged 5 Yuan to take the bird’s picture. 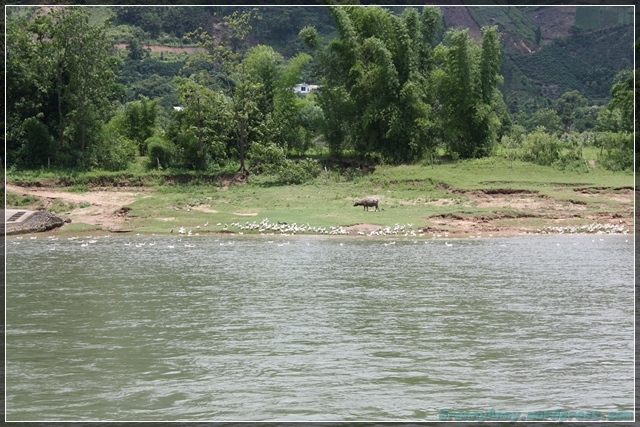 You can also pose with the birds if you want to. 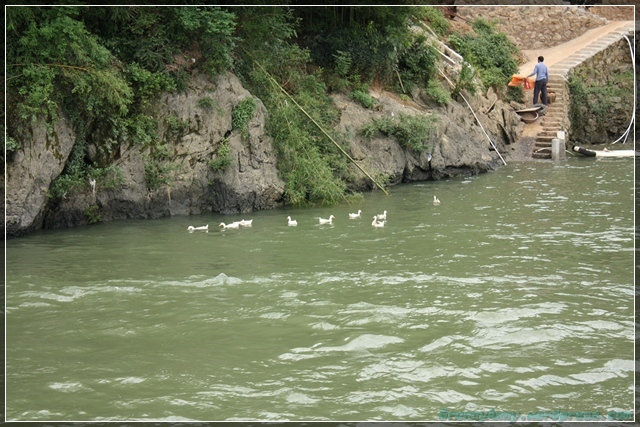 Then we started seeing flocks of ducks everywhere. 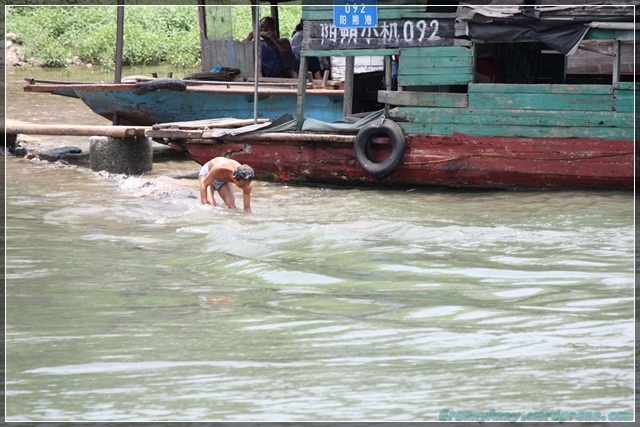 I guess we must be near the fishing village here. 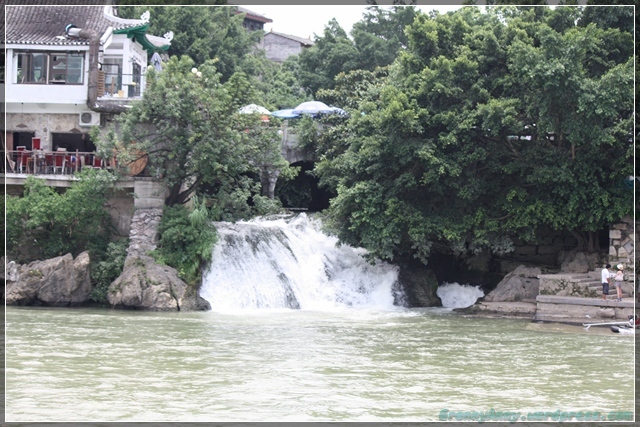 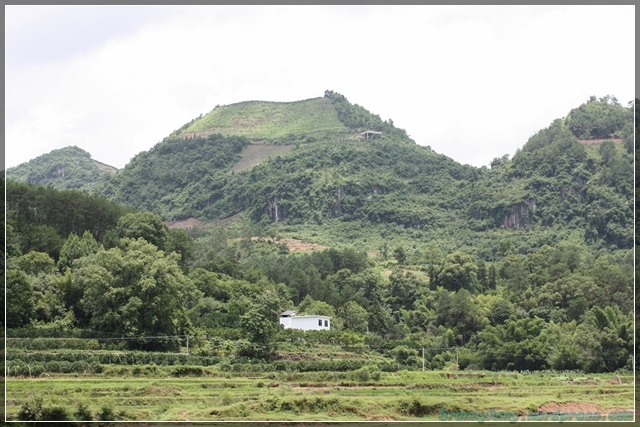 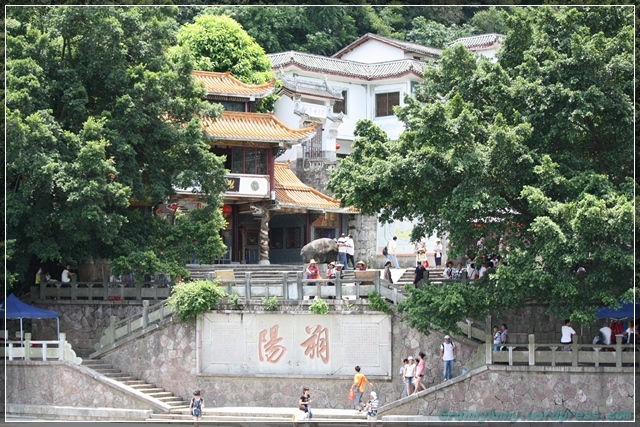 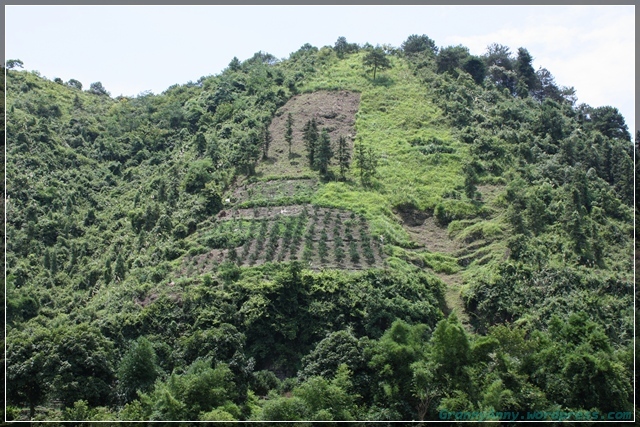 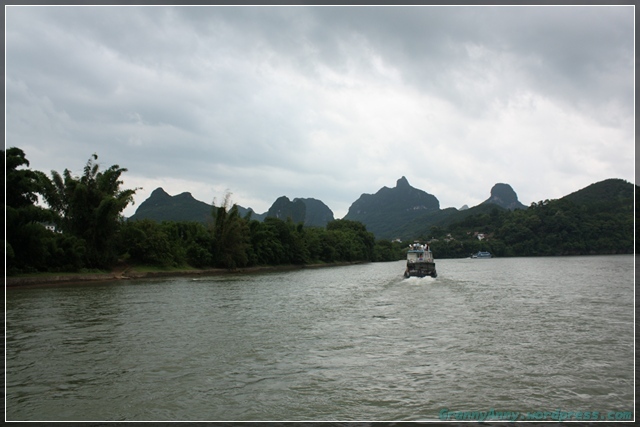 Finally, we approached Yangshuo area. 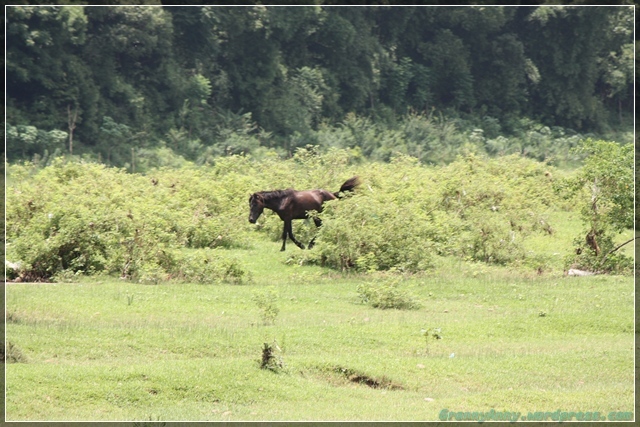 Right before we started heading toward the wharf, we saw this horse on a patch of land near the bank of the river. 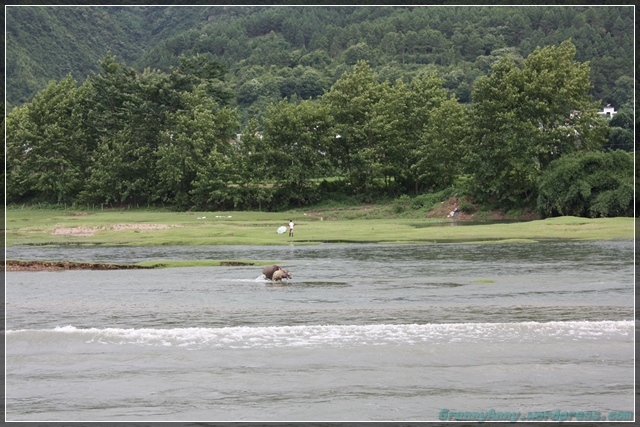 He was walking around by himself and oblivious to the amount of traffic on the river. 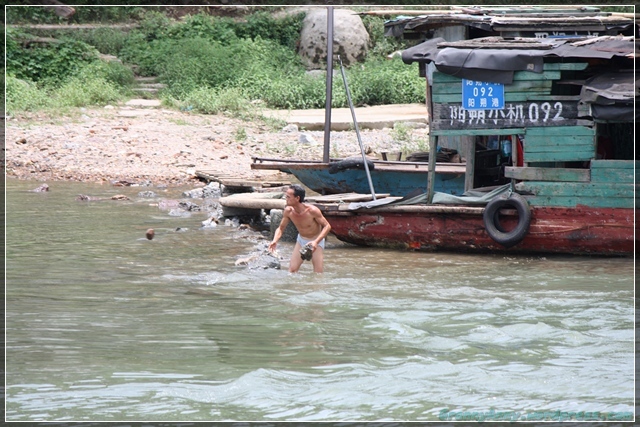 I also saw this man, and was wondering what he was doing. 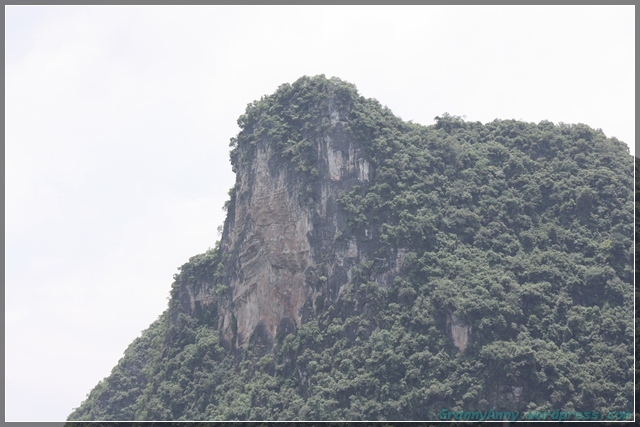 So I pointed my camera to him and start snapping pictures. 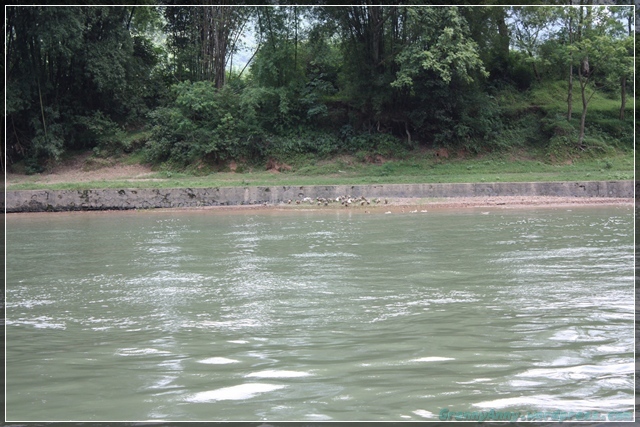 Can you guess what he was doing? 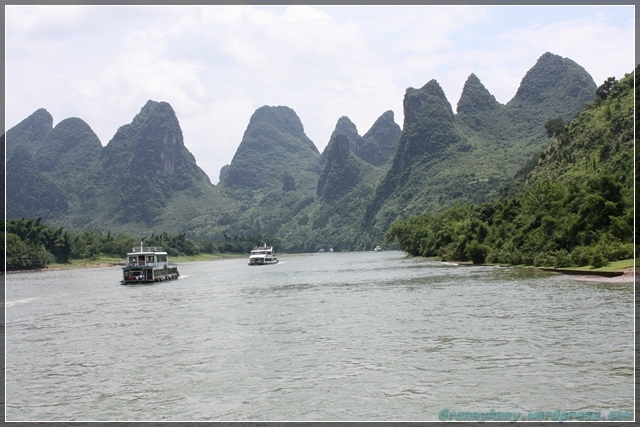 So that my friends, the end of our journey at the Li River. 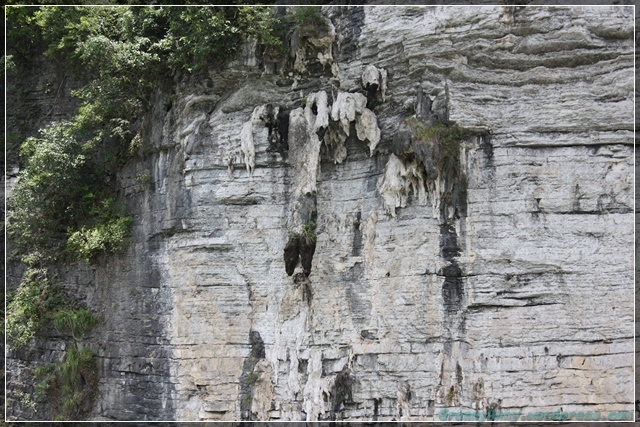 Have I bored you to death yet? 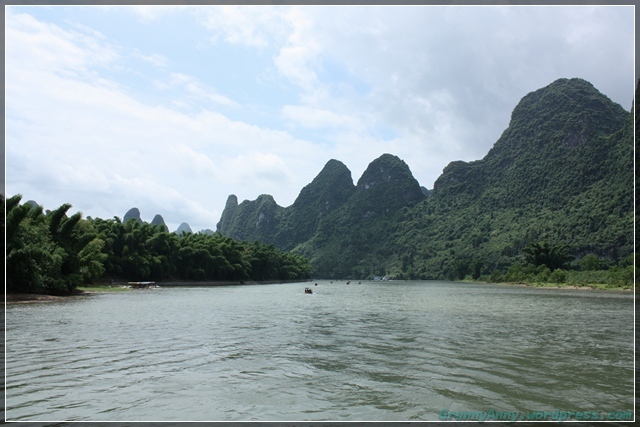 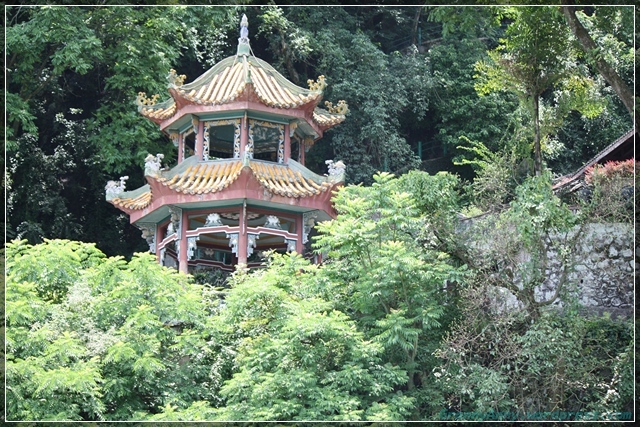 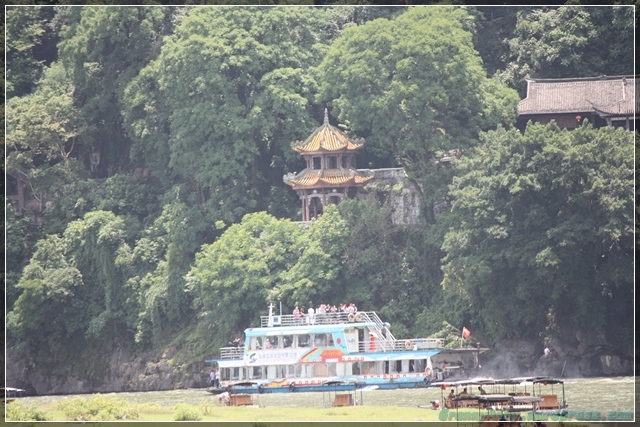 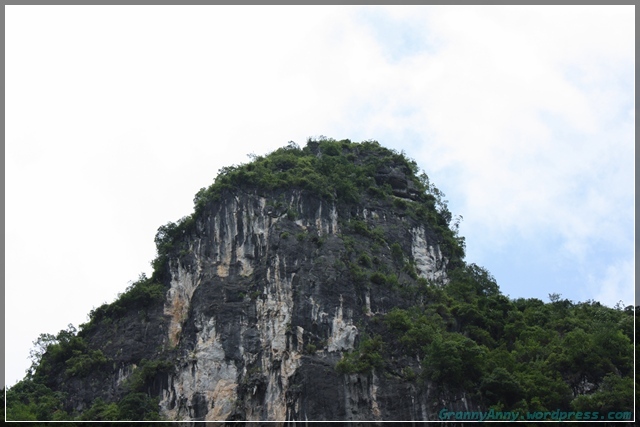 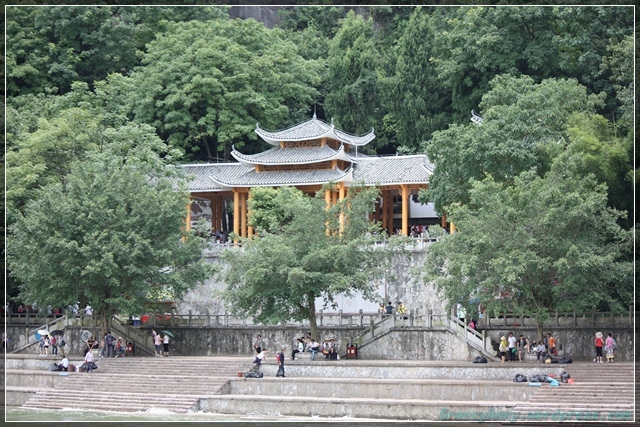 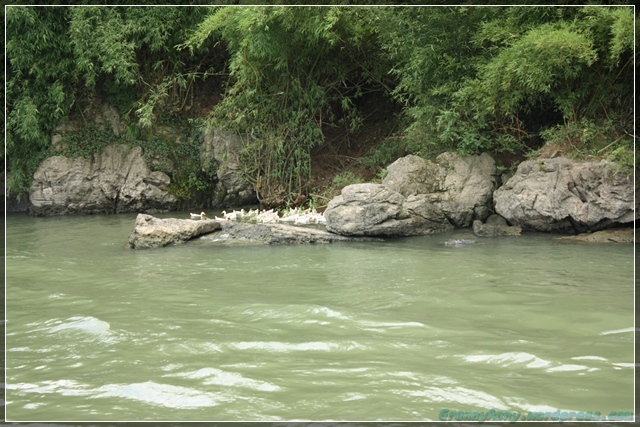 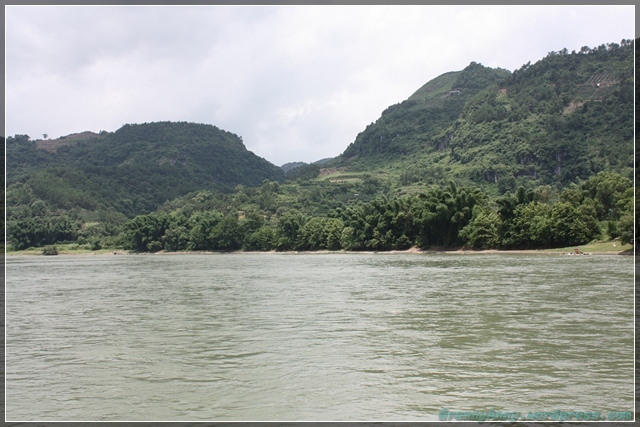 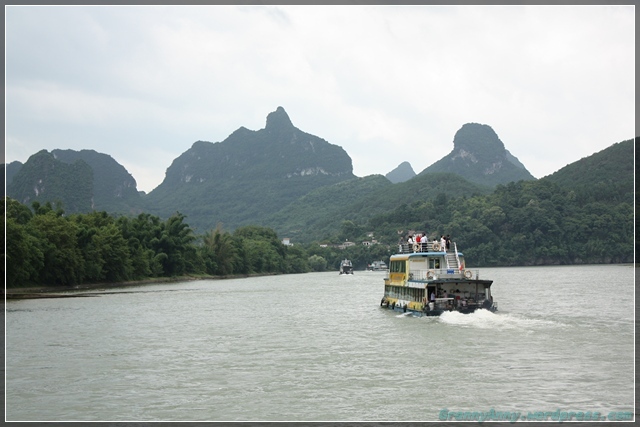 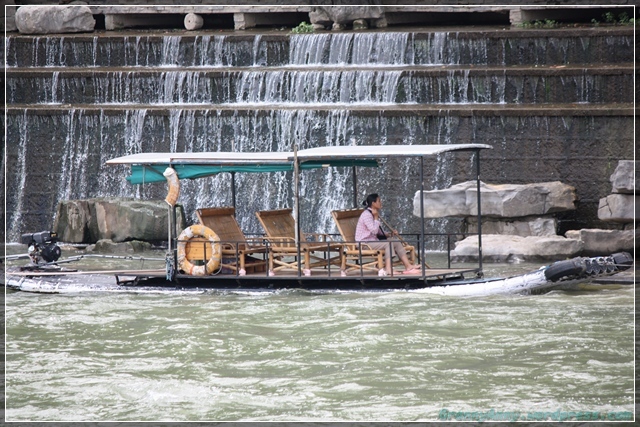 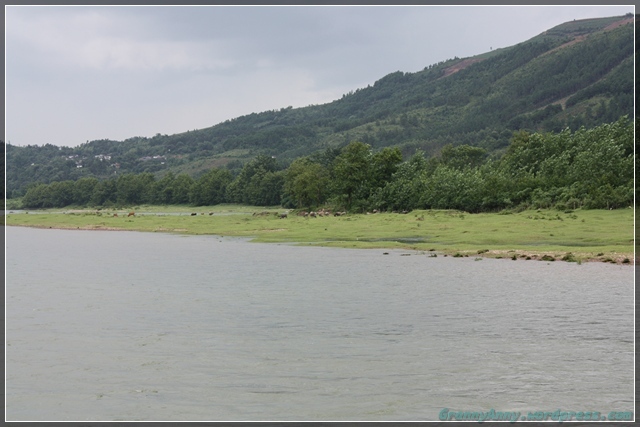 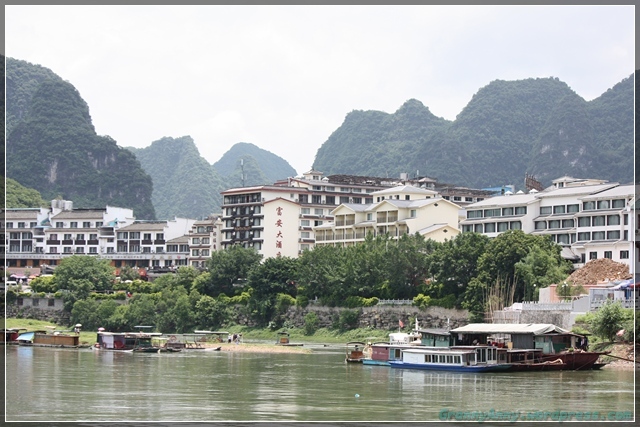 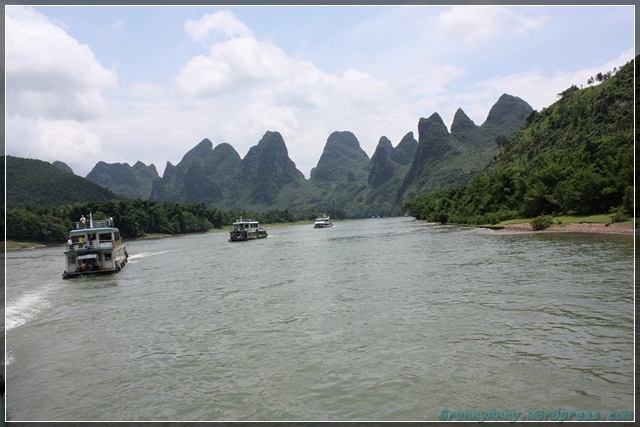 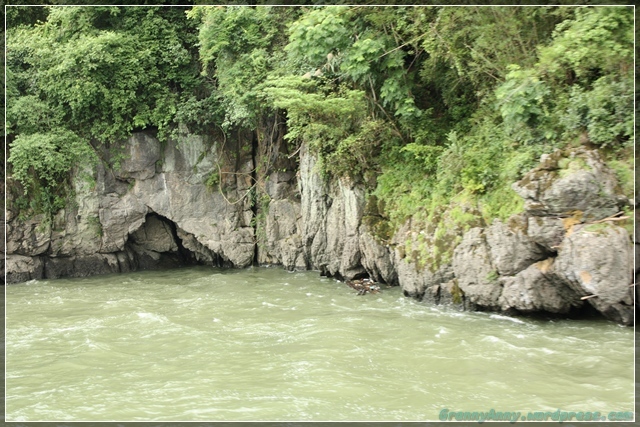 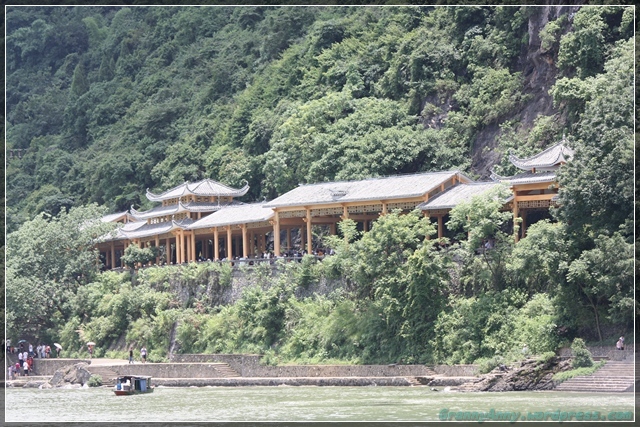 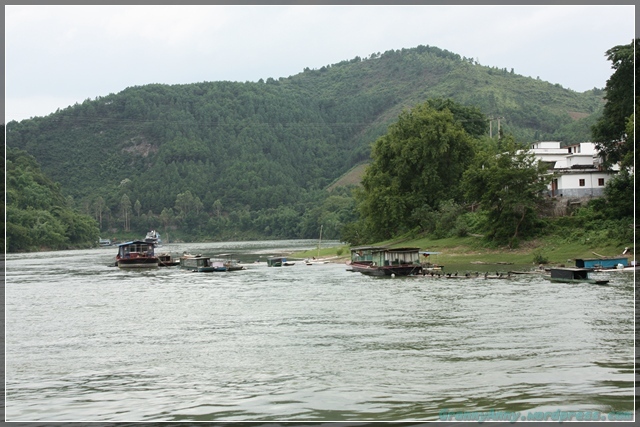 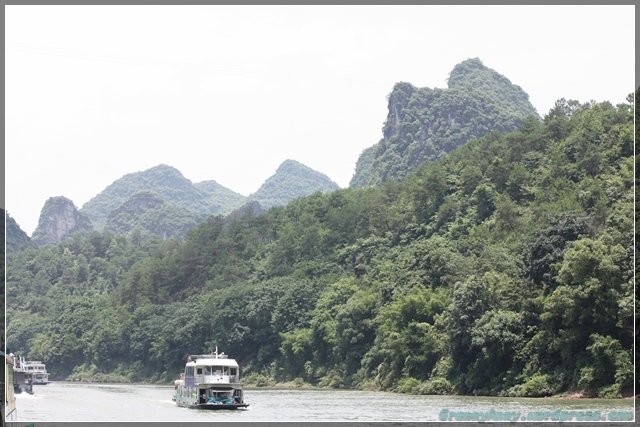 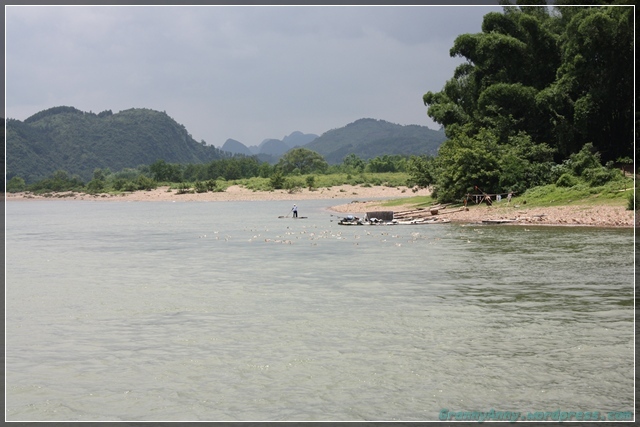 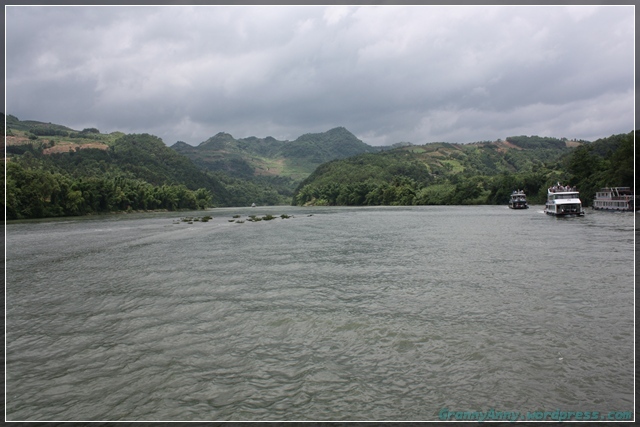 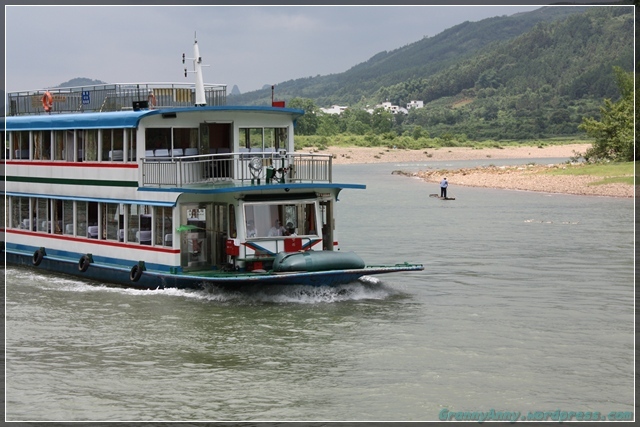 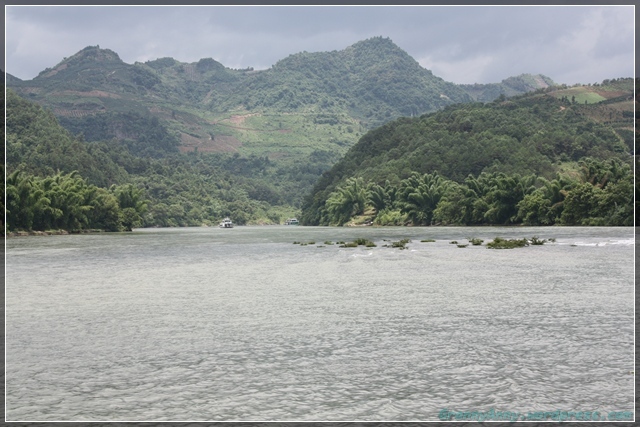 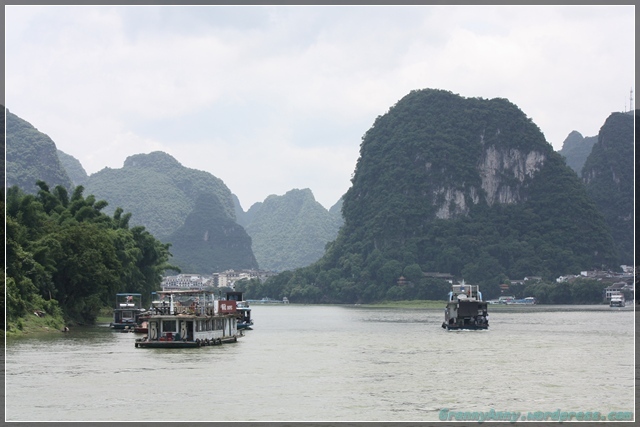 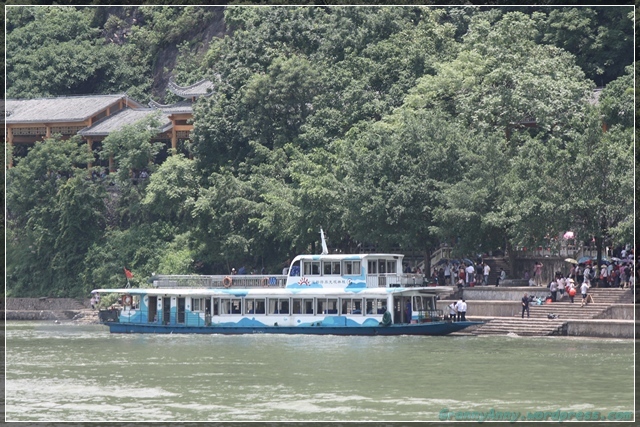 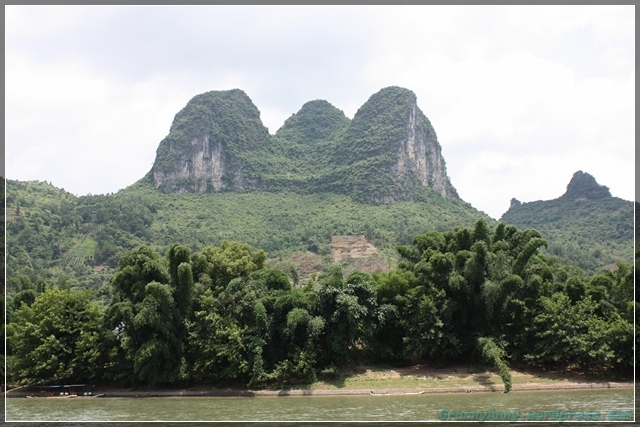 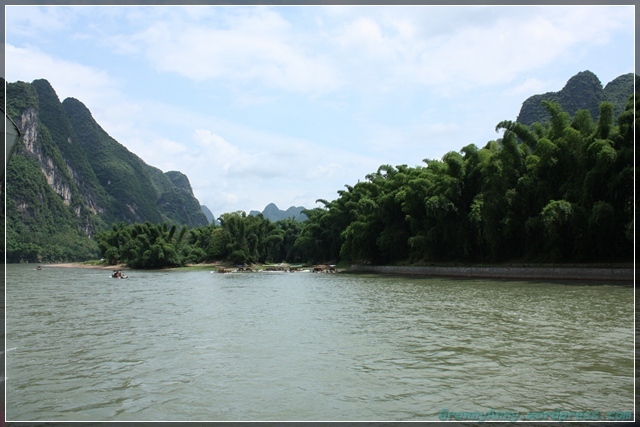 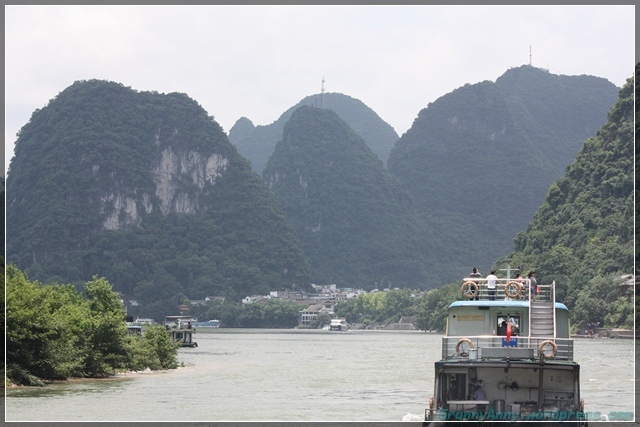 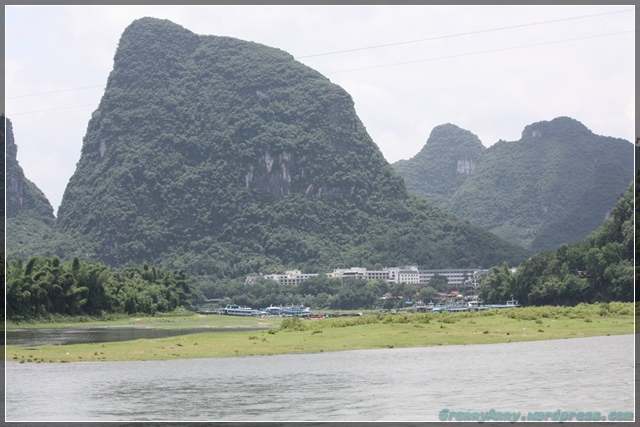 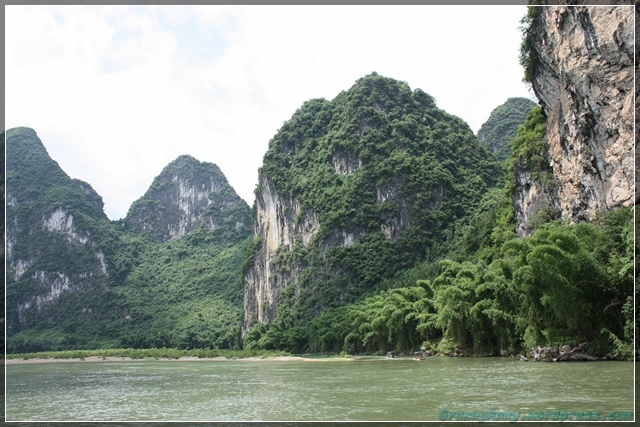 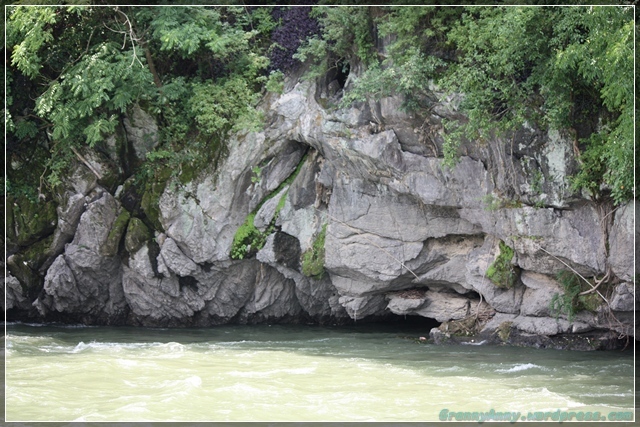 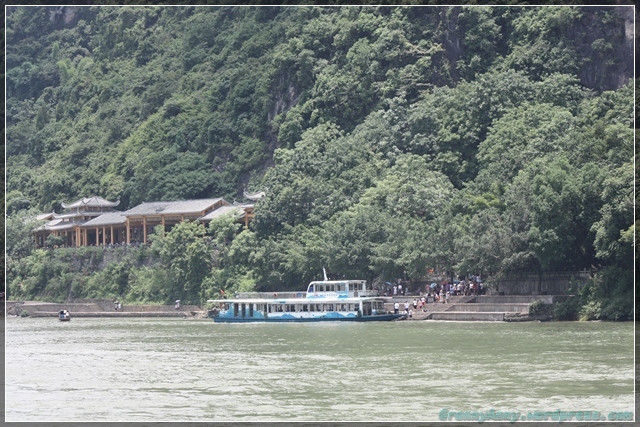 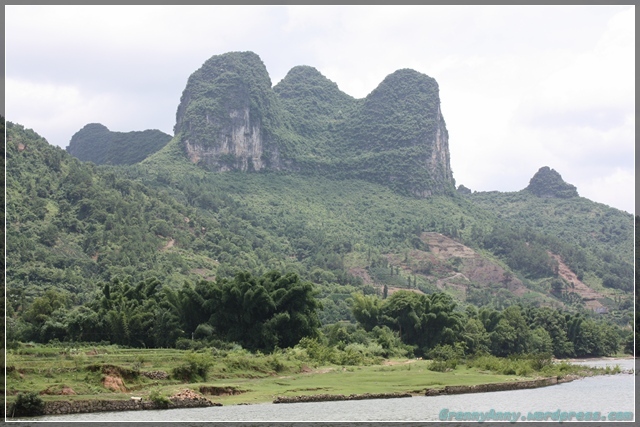 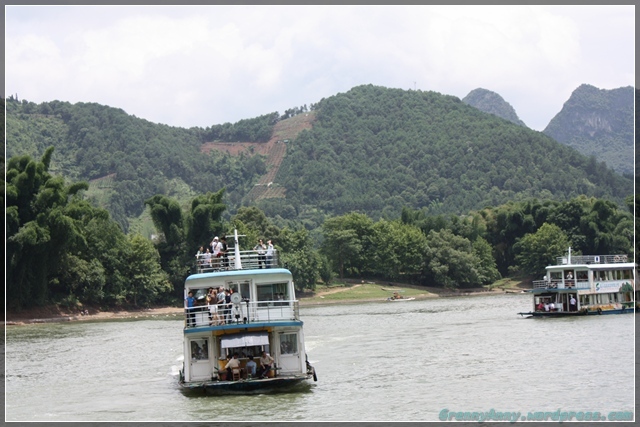 « Li River Cruise – Part 1.